Sprinkler System Installations in Los Angeles, California. Standard (none WiFi); $110.00 installation, plus $50.00 for the Timer, each. 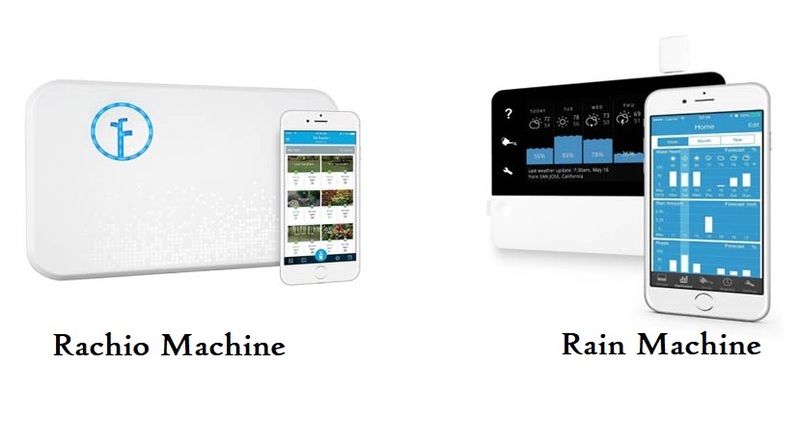 Optional WiFi; Rachio or Rain Machine (Rain Machine is my favorite) $150.00 plus $110.00 installation. Orbit B-hyve $110.00 plus $110.00 installation. Wi-Fi controllers that use your homes WIFI router to communicate with local weather internet sites to be more efficient and automatically adjust irrigation needs when it’s hotter, Santa Anna winds, or going to rain. These type of timers are more expensive, but may also qualify for rebates. Standard; $85.00 each. Plastic RainBird or Hunter valves. These are the only plastic valves that I would install at my own home, and so these are the only plastic valves I will install at your home. Sure there are others that are a little bit cheaper, but for just a couple more bucks the quality and reliability and just piece of mind goes way up. Optional; $125.00 each. Brass. Brass can handle more PSI so if you know you have huge pressure Brass may be the correct choice, it’s metal so it lasted longer, withstands more UV from the sun, can take the weather, and can be rebuilt if you can find the rebuild kits (online). Assumptions; Minimum 3/4″ Water Supply, Minimum 60 PSI. Less than ( 3/4″) Water Supply will limit the amount of water being supplied to a Zone which in turn limits how many Sprinkler Heads it can provide water supply to. Less than 60 PSI will limit the amount of pressure needed for Sprinkler Heads to perform correctly. No more than 100 linear feet of trenching, or 100 linear feet of Schedule 40PVC pipe. Each zone can not provide coverage for more than 1000 square feet of area, each area must be contiguous meaning unbroken spaces. Because in a drip system the client can literally ask for an almost unlimited amount of drip emitters which could cost more than the $400.00 that we charge for a zone. Because there are literally hundreds of different types of emitters specific to each type of plant. We do not supply anything more than the back bone leaving off at the 1/2″ riser pipes stubbed up ready for you the client to screw on what ever drip manifold or drip emitter you like.